If you live in a flood-prone area, are you prepared for the next deluge? According to the National Oceanic and Atmospheric Administration (NOAA), fast moving water that reaches just over your ankles can knock you off your feet. And don’t try to drive through it. Driving on flooded roads is the most common thunderstorm-related hazard that can kill you, according to NOAA. It is especially difficult to recognize flood danger in darkness or other conditions of poor visibility. As the National Weather Service urges, if you come to a flooded portion of roadway, “Turn Around Don’t Drown®”. If it is necessary to evacuate your home, head for higher ground at a pre-designated meeting place known to your family. Pet owners should have an emergency plan for their pets that includes shelter, food and water. If possible, turn off electrical power, gas and water supplies before leaving. If flooding is a common risk where you live, you may be able to avoid the backflow of unsanitary flood water into your house by installing backflow valves or plugs on drains or other sewer connections. Each member of the household should have a pre-packed emergency bag or kit that can be grabbed on the way out the door during a rapid evacuation. The bags should contain at least a change of clothes, a supply of needed medicines to last several days, personal hygiene items, flashlight, drinking water and some packaged emergency food that doesn’t require cooking. At least one bag should contain a first aid kit. Your cell phone can help you stay informed about flooding conditions and in contact with loved ones, so keep it charged especially during “flood season.” A hand-crank radio can be useful for prolonged power outages. Keep your car gassed up and some emergency cash on hand. Floods may cause public water systems to issue precautionary boil water notices due to turbidity or water main infiltration. If you have electric or gas service for your range, bring tap water to a rolling boil for one minute (or for three minutes if your elevation is greater than 2,000 meters or about 6,500 feet). To augment your water supply, the Centers for Disease Control and Prevention (CDC) recommends sanitizing bathtubs and sink basins with bleach [use about 1 tablespoon of regular bleach (5.25%) or 2 teaspoons of high strength bleach (8.25%) per gallon of water], rinsing, and then filling them with clean water and doing the same with empty soda bottles. (See Water Storage Tips to Assist in Emergency Preparedness.) Stay current with tetanus shots in the event that you sustain a puncture wound or a wound becomes contaminated during or after a flood. Children receive tetanus shots as part of their normal vaccination plans; adults require tetanus boosters every ten years. Flood cleanup starts with removing flood water (usually contaminated with sewage) and drying the affected areas. Evaluate all items touched by flood waters, deciding which to keep and which to toss. Whenever possible, use a disinfecting solution of chlorine bleach to disinfect items touched by flood waters. Wash contaminated clothing in the hottest possible water with detergent and chlorine bleach if fabric instructions permit. Disinfecting works best when all loose dirt and debris are removed first. That’s why the CDC recommends first washing surfaces with soap and warm, clean water. Next, use a household bleach solution to disinfect. Prepare a bleach solution (3/4 cup regular strength chlorine bleach or 1/2 cup concentrated bleach to one gallon of water) to disinfect walls, floors and other surfaces touched by floodwaters. Keep the area wet for at least two minutes. When addressing exterior surfaces, such as outdoor furniture, patios, decks and play equipment, keep surfaces wet with disinfecting solution for 10 minutes after removing loose dirt and debris with soap and warm, clear water. This may mean wetting the surface with disinfecting solution more than once. Carpets and rugs that have been soaked for more than 24 hours should be discarded. 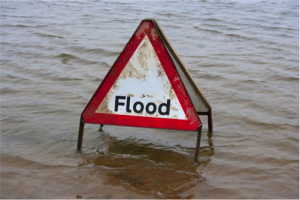 If carpets and rugs were soaked for less than 24 hours, evaluate as follows: Carpets that contacted sewage-contaminated floodwater should be discarded. Carpets that contacted only clean basement seepage or lawn runoff may be dried and cleaned. Washable throw rugs usually can be cleaned adequately in a washing machine. For more information on cleaning flood-damaged carpets and rugs, see this North Dakota State University website. Chlorine bleach solutions degrade quickly, so be sure to make a fresh solution daily as needed. Unused solution may be discharged into the toilet or sink. Finally, if you have a private well on your property that is below flood level, it is recommended that under non-flood conditions you extend the top of the well above the expected flood level and install proper seals on all openings into the well to prevent entry of flood waters. If a well is flooded, refer to the US Environmental Protection Agency’s What to Do After the Flood for directions on decontaminating your well.